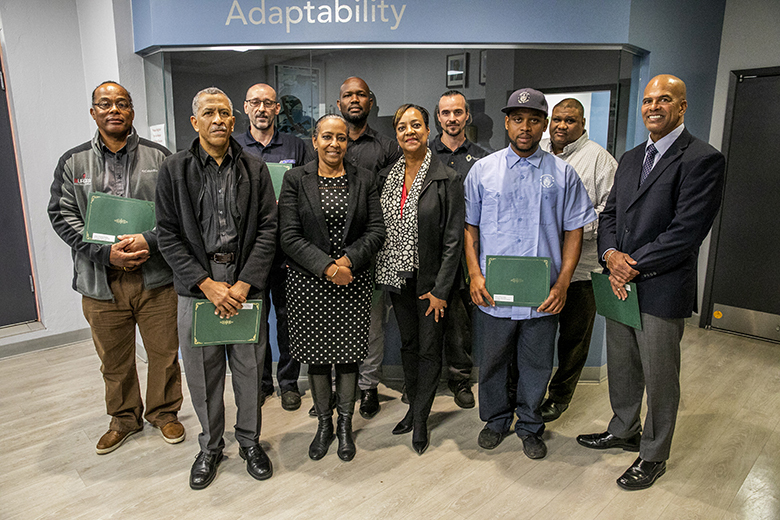 Last week the Minister of Labour, Community Affairs and Sports Lovitta Foggo presented completion certificates to some of the 15 individuals who recently finished their Prior Learning Assessment Recognition [PLAR] professional development training. Participants representing the Automotive, Electrical and Landscape industries, the Occupational Advisory Committee, the Industry Assessment Panel, and staff from the Department of Workforce Development completed the PLAR training and have now received Certificates as PLAR assessors to support National Certification. The training session, which was sponsored by the Department of Workforce Development, was led by Dr. Charles Joyner and Mr. Mark Allison Gallupe from the Canadian Association for Prior Learning Assessment [CAPLA]. As a part of their training, participants learned methods for assessing individuals based on their informal learning, prior experience and on-the-job training. As a result of the training that they received over the summer, these individuals now serve as Industry Assessment Panel [IAP] committee members, assisting tradesmen in obtaining national certification in their designated occupations, through a series of assessments. “Recognition of Prior Learning [RPL] is a philosophy with immense value for those who work with tradesmen. The main principle is that everyone has knowledge and skills that can, and should, be recognized. We can help tradesmen identify and prove their learning by using reliable tools and supportive systems that take into account their unique needs.